Advanced Technology Services is ITCL’s department responsible for providing technological support to companies. We offer a series of personalized services tailored to each client. Energy Efficiency: We help you to capture, monitor and control the energy consumption variables in your installations from any place in an intelligent and integrated way. Big Data and Smart Factories: We perform advanced analysis of your process data and implement artificial intelligence applications that provide true added value. Business Intelligence and Business Analytics. 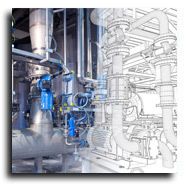 Design maintenance systems based on reliability (RCM).